I turned over the page of my copy of Suzanne Le Good's beautiful Siamese cat calendar above recently, with a feeling of ... surprise? ... alarm? ... that we're already into October. And we're already more than half way through it. Ouch! September was altogether too busy and you'll have noticed that I didn't send out a September newsletter. I was asked to work on a project that took over my life for weeks, and I'm only now getting back into something of a more usual pattern. But I always enjoy turning to a new page on Suzanne's calendar and October, with its cold, starry night, harvest moon and pumpkin is a reminder of the turning seasons. The month of Halloween - and Canadian Thanksgiving, which was last week but if you're Canadian, I hope you had a happy one! - and soon we'll be heading towards Bonfire Night in the UK, American Thanksgiving and then Christmas and other holidays. 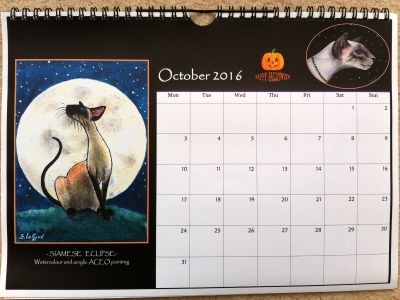 If you'd like details of Suzanne's calendar you can find them further down the page, along with her very topical Halloween decoration and news of a recently published novel, for which Suzanne provided the front cover illustration. Wasps and Webs and Spiders, Oh My! Somewhere near our house there's a wasps' nest. The wasps have been extra-busy flying to and fro preparing for winter, and as it's getting colder they must be getting sleepy as we've found several crawling around on the ground. Bandit must have walked over one of these and been stung; he came in from the garden a couple of weeks ago with one paw double the size of the other. I panicked! And then I phoned the vet. It was late in the day and they didn't have any remaining appointments, but we talked and the vet, while saying that I should keep a close eye on things and call if Bandit seemed ill, didn't think this was an emergency situation and made us an appointment for the following day. So, out of interest, I looked up stings in my copy of The Cat Owner's Veterinary Handbook and found an interesting piece of advice which is useful for humans as well as cats. When wasps sting, they don't leave their stings behind but withdraw the sting and fly away. Bees, on the other hand, leave their stings behind and then die. So before you can do anything to treat a sting, you need to know what you (or your cat) were stung by. If it's a bee, you need to take out the sting if you can - it looks like a short, dark hair with a bit of the bee still attached. Bee stings are acid, so to counteract the pain you need to bathe the area in a mild alkaline solution, like bicarbonate of soda. Wasp stings, on the other hand, are alkaline, so you'll need to bathe these in a mild acid, like vinegar. I couldn't be certain what Bandit had been stung by (or even if he'd been stung at all, although this seemed like the most likely explanation for his swollen paw) so I did nothing except watch and wait. I had a rather sleepless night! By morning, though, the swelling had gone down and even though the paw still seemed a bit tender when I touched it, Bandit himself seemed fine and was eating, drinking, and walking around quite normally, so I felt safe to cancel the appointment with the vet. Note: This was a paw swelling. Stings or any swellings around the face or throat are potentially more serious and should certainly be discussed with, and probably checked by, a vet. Our house has been hung with so many spiders' webs this year. Bandit enjoys chasing spiders and eating them - apart from their legs; the only way I know he's eaten them is by the small pile of legs he leaves behind. Thankfully there are no dangerous spiders in the UK! These particular spiders like to make their webs outside the windows, and I've spent a lot of time cleaning them all off. By the following morning, though, they're all back again so I've now decided now to leave them up as Halloween decorations. Well, that's my excuse, anyway! 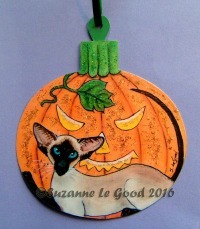 For prettier decorations than spiders' webs, I love this Halloween pumpkin which I found it in Suzanne Le Good's Etsy shop when I went to look for her calendar. I thought you might like it too, and it's very topical. Suzanne also makes lovely Christmas cards, if you're already thinking ahead! 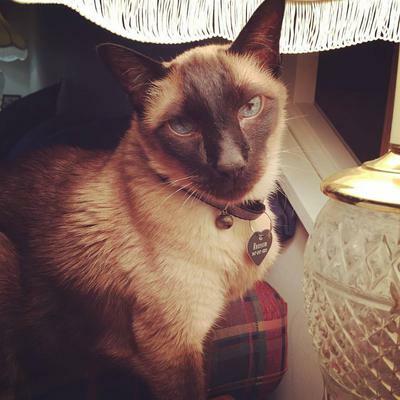 Our Meezer of the Month this month is, very sadly, no longer with us. 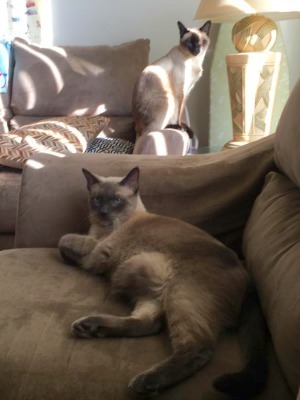 You may remember that back in August our Meezer of the Month was kitten Ziva, who'd recently joined Ransom (pictured below) and Jazzmin in Donna Castele's household. Donna and her husband Reed lost Ransom this month to illness, and Donna wrote a very touching tribute to her loner, 'misfit' boy, who finally found a feline family with Jazzmin and then little Ziva. You can read Donna's story in Ransom, The Misfit Who Finally Fit In. Ransom, earlier this year. RIP, little fella. 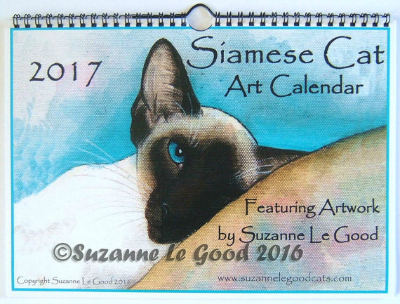 I promised above that I'd give you details of Suzanne Le Good's 2017 Siamese cat calendar. 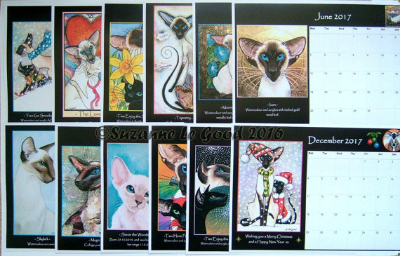 I've always adored Suzanne's artwork and gifts and her annual calendar is such a joy, with its bright pages and wonderful selection of cats. The 2017 calendar is now available and you can find further details by clicking either of the photos above or below. Coincidentally, Suzanne also provided the image for the front cover of a new Siamese cat novel, Return to Tythecott, that I heard about recently. Bandit, as I've mentioned before, is a rescued stray cat who came to us from the Siamese Cat Club Welfare Trust, and we know nothing of his background other than the area where he was found. I've often wondered how he could possibly have ended up wandering the streets. When he was picked up he was healthy and looked well cared for, but in the three months he was in the rescue no-one ever came forward to claim him, despite efforts being made in the area to locate his owners. He didn't have a microchip. Who owned him? How did he get into that situation? Where had he been? I'm sure anyone who's ever taken in a cat with no knowledge of their background has probably also wondered this - perhaps you have yourself? Well ... one inspired author took that wondering to a whole new level, and wrote it all down. 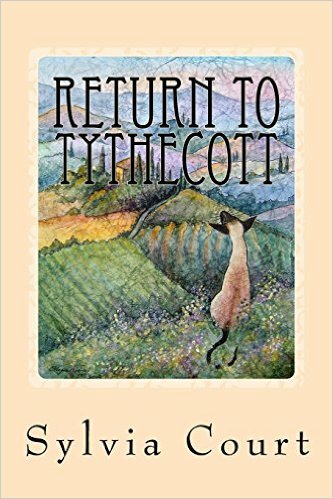 Return to Tythecott: The Story of a Siamese Cat, by Sylvia Court, stars a Siamese cat called Rufus who through no fault of his own ends up out on the very frightening streets, all alone. Sylvia's book tells the story of what happens next and follows Rufus through many adventures, finding human and animal friends and foes along the way. The beautiful front cover is illustrated by Suzanne Le Good. The story rather reminded me of The Incredible Journey, and I really enjoyed it and didn't want it to end. I loved how it did end, although I won't say more than that as it would spoil the story! The book is available on Amazon, both as a paperback and for Kindle and because I wanted to get it quickly so that I could review it, I bought the Kindle version. I think, though, that it's nicer to have the paperback, because you don't get Suzanne's beautiful cover with the Kindle version. We're heading towards Halloween - tricks and treats, unexpected visitors, extra noise, frightening masks and costumes. Lots of fun for those taking part but for our pets it's a different story. Here in the UK we also celebrate Guy Fawkes' Night on November 5th with bonfires, fireworks and other festivities, and what used to be the celebration of just one day has turned into a two-week-long (or longer) firework-fest which starts at the end of October. A very frightening time for many animals. So here are some tips for keeping your cats, dogs, and other animals as calm, safe and happy as possible during this sometimes confusing and noisy season. Keep your animals inside in safety. At Halloween you'll be opening your front door more often than usual and it's easy to forget to check where your cats are. So make sure, before the fun begins, that they're safely shut in a room where they won't be affected by any unusual comings and goings and, especially, won't be able to escape outdoors. In your quietest room, make a hideout for your cat and create a safe space there with beds, toys, food, water, litter tray and any other comforts, while the festivities are going on. Close windows and doors, and draw curtains or blinds to help limit the noise that comes into the house. Regulars John and Erin Broemelkamp have recently added another Siamese cat to their household - the very handsome Han Solo, pictured here in the foreground giving the cold shoulder to seal point Princess Leia after an argument - you might call it a Star Wars standoff! They'd been playing together nicely earlier though, and John assures me that they're now good friends again. Bandit has just had a six-month check-up which revealed that he needs some dental work, which he'll be having on Tuesday. With luck he'll only need a scale and polish, but work under anaesthetic is always rather worrying so think of us and keep your fingers crossed. That's it for this month. Other things permitting I hope we'll be back towards the end of November when we'll be looking towards American Thanksgiving, Christmas and the holiday season. In the meantime we wish you a good month wherever you are, and a happy time if you're taking part in Halloween fun. Keep your kitties safe and hug them tight!